Once the windows were in, one of the workers began to try to place the old trim back in place. Corners did not line up, pieces of wood were missing or broken, and as if these things were not enough, he used way too many nails, as many as nine on one corner alone. My husband asked him to stop by the second one and stated we would replace them ourselves. Later, as the painter was finishing the trim and windows on the outside, I noticed that they were only painting the trim around the windows and not the sashes. "Oh, no. I wouldn't paint the sashes." We made a point to buy the more expensive paintable windows. They are not wood but a paintable PVC. In fact, I had a window sample right here in my living room for a few weeks as we were deciding on the material and paint colors that had a sticker on it clearly stating that they warranted Sherman Williams vinyl safe paint to be on the windows. However, when I talked to the contractor, he told me that he would not suggest we have the sashes painted because the paint would fail within five years due to the glass heating up the vinyl. That just had been his experience with vinyl windows in the Georgia sun. Although I remember that he also told us when we first talked to him about the job that he said the windows were a new product for him. So, at that point I had a yellow house with a cream trim and white windows. Had I known they were not going to paint the sashes, I would have picked a better contrast for the trim because as it was it looked like we had the cheaper replacement widows that cannot be painted or very poor taste in color combinations, take your pick. The painters told me how they liked the look.... Yeah, well, the problem with that is it is my house and I do not like it at all. I called the window manufacturer...twice. I do that sometimes just to see if I will get the same answer both times. Yes, the windows are not only paintable but the outside has been pretreated with a primer coat that is warranted for ten years. Although, they had changed the warranty recently, it used to be that the warranty was void if the windows were not painted. The only stickler was that it had to be Sherman Williams vinyl safe paint, which is not a particular paint but rather colors of certain values, basically only light colors could be used and the cream color I had picked was within the acceptable range. Once the workers were done with the job and we had paid the contractor at the end of June, I began to pull out the sashes and painting them on both sides, as well as touching up missed areas on the outer trim. Since it had been raining a lot all this year, this process was spread out over a longer time than I hoped. I kind of figured that it would not be done until the end of September if all went well, but it actually was into the middle of October. I am still thankful that we have had a rather warm autumn so I could get it done. My husband had to finish the picture window on a ladder and the one window over the kitchen sink as I just could not touch up the trim but he missed opening the window to do the sill (which is why I wanted to do it myself), but I can contour enough get it from the inside, I hope. Except for the sill of the sink window all the exterior window parts have been painted. We still have the front door to paint and the shutters as well as. Not sure when those will get done but eventually they will. On a few rainy days I worked on patching the walls and just as I was finishing that, my husband decided that most of the windows were installed evenly as he was beginning to put the trim on, so he re-seated them and in the process, the plaster board again needed to be patched, particularly under the window. 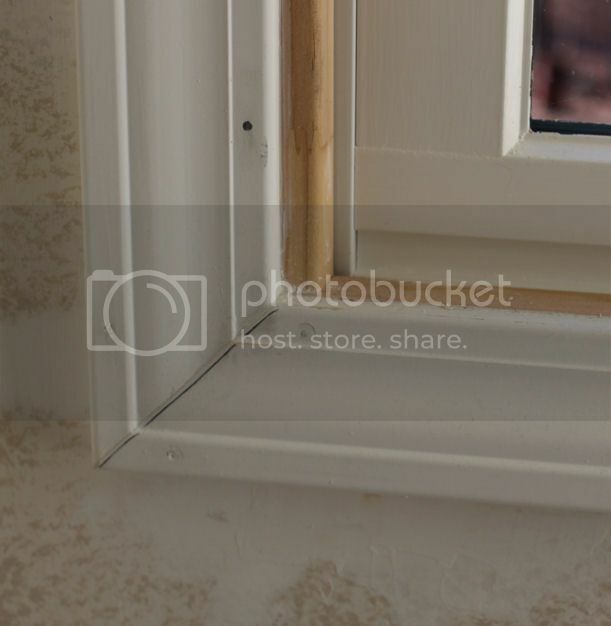 This is a picture of a new window in the rough in our bathroom. I began finishing the interior around the windows in the the most difficult room first because I had to match the faux texture paint in my bedroom. Writing that makes it sound so much easier than it was. Apparently, we had no paint left of the base color and we did not keep the lid with the tint mixture as we now do with it marked which room it was used and such. The color I finally got was close but not quite and then...my husband finds an extra paint can of the base paint. I just got to love the man. Well, it is done now and looks great, but it did take me a long time. Long enough to wonder if I really wanted to attempt this in the guest room, even though we do have the paint and glazes for that room, but if you read a recent post, you know we will most likely be painting differently to give to the Princess. I had only repaired the walls around the windows and painted trim around the windows in the Princess' current bedroom before that little thing I call life broke lose here. I was determined to finish the window where our Christmas tree goes before we got the tree last Friday, but...as I began to repair that wall around that window, I realized that it had more problems than I expected. Remember that I mentioned we had termites? They did not do serious damage to the supporting structures except the chimney, which we had rebuilt, and since we had the siding off the carpenters as well as we got a very good look, however they did make some tunnels in the plaster board that would make the paper bubble out when it was painted, not so bad that we need to rip out the plasterboard and replace it, as it was just here and there, but enough that it was necessary to press the board inward and plaster over it. Just when I thought I found it all, I would find another spot, which happened several times over three days. The Christmas tree window is now done. While the paint for the living was really used up (and no hidden cans could be found this time), we took in the lid we saved with the tint mixture and—thank you, my Lord—it matched! I even touched up the wall next to the four steps up to the dining room and I cannot any difference at all. So I am hoping to finish the other living room window in a day, probably tomorrow. Then we have lots more to do because when the windows in the dining room and the kitchen were replaced, it ripped the wallpaper that I have have wanted to change since we lived here, but the patterns were acceptable and the colors worked at least. We just ripped it all off, except behind the china cabinet and above the kitchen cabinets. We will need some friends to help us with the hutch, at least. So, basically, the only rooms in our house that are not in need of being completely re-painted are the living room, the guest bathroom (as it has no windows but the cabinet needs to be painted), and my bedroom. Maybe next year at this time it will all be done...maybe. My Lord, please give me the motivation and perseverance to finish these home improvements on the inside as well as on the outside.